Hello again saltwater aquarium fans, it’s time for the annual Saltwater Aquarium Blog Most Popular Reef Tank Items article. This is the list of the top items purchased online by the readers of Saltwater Aquarium Blog. It’s probably not a surprise to you that Amazon.com is carrying more and more saltwater aquarium hobby products every week, in their quest to take over the world. They also provide website owners like me with a program to help offset the costs of running the website (paying for things like domain names, web hosting, themes, website building, advertising and all the other expenses of running a site like this). Essentially, the way the program works is that if you buy something from Amazon as a result of clicking on one of the products linked to in an article, they send a small commission to the website owner (in this case me), at no additional cost to you. Then I get a report of the items purchases (I never know who purchased what, just that the transaction happened). At the end of the year, I run a report and then publish the results of the most popular items. This report is based on real data that I collected over the past year. These data biased for a lot of reasons, and don’t quite represent what the absolutely most common items purchased online are–but they should create a fun and interesting article and review. Hopefully, you’ll be inspired by one or two things you see here and get a good idea or two for the upcoming holidays. If not, well, I just hope you enjoyed reading it. This popular reef salt is the 10th most commonly purchased item by saltwater aquarium blog readers. So if you’ve been thinking about trying a new reef tank salt mix–you might want to think about this one. If you’re already a big fan of Red Sea Coral Pro reef salt, give yourself a pat on the back for making the list! With an average review of 4.5 out of 5 stars, the people who buy it are clearly happy. The nay-sayers are mostly complaining about the fact that the price fluctuates, not about the quality of the salt itself. But stay tuned to see what other salt mixes are even more popular. I am honored and humbled that Reef Journal made the list of the Top 10 Most Popular Reef Tank Items purchased online. It shows me that you many of you like what you read here and are looking for more. To learn more about the Reef Journal, to see if it’s something you’d enjoy having, check out this article here. Order your copy of the Reef Journal on Amazon. There are a lot of reactor brands available to aquarists today. For more information, you can check out the article about the best aquarium reactor brands — you will find a more thorough review of the PhosBan reactor as well as some of the other brands, as well. Glad to see some of you are feeding your fish and corals, too–that is a good sign. It is interesting to see that the Kent Marine SeaSquirt Feeder is the most popular reef gadget/gizmo and is much more popular, among Saltwater Aquarium Blog readers, than other items like Julian’s thing. 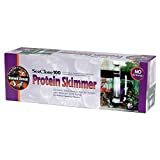 This item, which is #6 on the list of reef tank items overall is also the # 1 supplement for starting out a new aquarium. Instant Ocean Bio-Spira is a water supplement that you would add to your tank to make it safe for adding fish or corals instantly. Very interesting, indeed. It is an insanely popular item on Amazon and boasts nearly 20o reviews at a 4.6 out of 5 stars average. No surprise here that the test kits show up in the middle of the list here–and equally not surprising is that a calcium test kit shows up as the most popular test kit–and the # 5 overall most popular reef tank item purchased by saltwater aquarium blog readers. Calcium is probably the most important nutrient to help your corals, clams and other inverts build strong skeletons. If you want to know how much calcium is in your water, you have to test for it–and API makes one of the most economical (lowest cost) tests in the market. The # 4 slot is occupied by another test kit–this time–by the API Saltwater Master Test Kit. It is the kit I recommend most newbies should order when they first set up their saltwater aquarium. The kit comes with 4 tests: ammonia, nitrite, nitrate, pH. Those are the tests you will want to confirm your tank is cycling and/or has completed cycling. Once you get these basics accounted for, you will want to branch out to some of the other tests as well, including the calcium and hardness and phosphate test kits. This is the book I published in April 2014, to pull together my advice for starting a new saltwater aquarium into a single, organized guide. It has been a #1 Bestseller on Amazon in the US, UK, and Australia. I’m humbled to see that it is standing the test of time here and still ranks within the Amazon ecosystem (there have been a lot of books published since) as well as to you loyal Saltwater Aquarium Blog readers. The book boasts a 4.4 out of 5 possible stars. If you have purchased a copy, thank you. I sincerely appreciate your support. It is a privilege to offer you my help. It’s a good book and a fast read, but it is not for everybody, check out the reviews to see if it’s something you would enjoy. 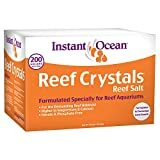 The # 2 most popular reef tank item purchased by Saltwater Aquarium Blog readers is the Reef Crystals brand sea salt, by Instant Ocean. This salt has a higher concentration of calcium and other nutrients and is targeted for those who want to keep a coral reef aquarium. Instant Ocean Sea Salt is the most popular marine salt mix purchased by Saltwater Aquarium Blog readers–it is also the most commonly purchased item, in general–and by a long shot. Readers purchased 2x’s more Sea Salt than Reef Crystals and 15 x’s more than Red Sea Coral Pro. It might not surprise you to learn that the Instant Ocean Sea Salt is my brand of choice as well. You can read about it and compare to other salt mixes in one of my most popular articles here. The thing I love the most is using Prime shipping to have my ridiculously heavy box of salt arrive in two days. It doesn’t surprise me that 3 of the top 10 items on this list are reef tank salt mixes. Those are staples in the hobby–and let’s face it–it is a real pain to pick these up in the store–because they are so darn heavy. I switched to buying my salt online a few years ago and never looked back. I am a bit surprised that there weren’t more test kits on the top 10 list. I would have hypothesized that test kits were next most common consumable in the hobby. But I guess they last longer than I thought. It’s good to see that people are, generally speaking, testing their water. 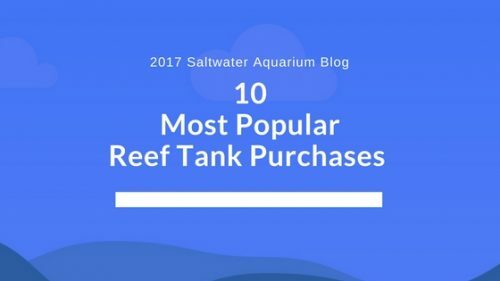 The fact that the saltwater master kit and Bio-Spira are both in the top 10, it does suggest that the average reader–or at least the average reader who ends up buying something after reading one of the articles on this site–is just about to set up their tank. Is that you, too? I’m intrigued to see that the most commonly purchased piece of equipment is the PhosBan reactor. This truly is a versatile piece of equipment and is affordably priced. I’m surprised there weren’t any other books to crack the top 10 list. I would have figured that the readers of this site would also have an active appetite for all books about the hobby. Wonder if I’m being too pushy about the books I’ve authored? I hope not, but I will try to do a better job of balancing that out. This list wouldn’t be possible if you weren’t there reading what I write–and occasionally visiting the links to products on Amazon. Thank you for supporting my work here, my books and the website in general. I am grateful for your readership, support, and friendship (for those who email me or connect on social media). If you want to support me and this website, you can do so by purchasing any item on Amazon (not just the ones linked here) after clicking directly through one of the links, like this one here. Thank you. Here’s looking forward to another year on Saltwater Aquarium Blog. I can’t wait to see what products crack the top of the list next year.